W.O. Voor Paardeberg. Fermented and matured for seven months in older French oak barrels. Yellow apple, stone fruit and green melon plus some leesy complexity on the nose. The palate appears sweet-fruited and quite plump (RS is 5.1g/l) though there’s also fresh acidity lending verve – impossible not to like. W.O. Stellenbosch. Fermented and matured for eight months in second-fill French oak barrels. Fresh herbs, citrus and peach plus a hint of leesy complexity on the nose. Good fruit concentration, bright acidity and some phenolic grip on the finish. Well balanced and none too overblown. 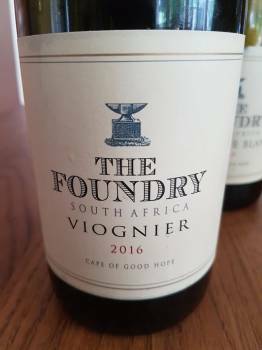 The Foundry Roussanne 2016 was rated 94/100 in a previous review – see here. W.O. Stellenbosch. 15% whole bunch fermentation. 40% matured for five months in older French oak barrels, the rest in tank before blending and another five months in concrete. A top note of fynbos before red and black fruit, earth and spice. Medium bodied with pure fruit, fresh acidity and a pleasantly grippy tannins – has a nice “crunch” to it. W.O. Stellenbosch. A top note of fynbos before red and black fruit plus white pepper. Juicy and fresh, the tannins just starting to resolve. Nice integrated by virtue of time in bottle. I find your score for the Grenache Blanc curious considering how highly it was regarded by the entire Platter panel. As I understand it everyone involved with the guide tastes the wines of the year blind and it must’ve scored very high to get the accolade. Why do you score it so low? Hi Simon, The first observation I’m obviously going to make is that 91 shouldn’t be considered a low score. Secondly, I tasted the Grenache Blanc before the Platter’s announcement without any idea that it was about to become one of the most talked about wines in the country and found it almost too approachable – I was given cause to scrutinise the analysis after its success in Platter’s and I do think an RS of 5.1g/l is worthy of some debate if not outright problematic. especially in light of the group of people that obviously awarded it a very high score for it to get there in the first place. Further – to me your statement “Too approachable” is problematic. Can a wine not be approachable and complex and wonderful at the same time? Does one have to look for austerity and lean acidity in all wines for them to be great? I personally fail to see what the residual sugar matter. Some of the greatest wines in the world are German Rieslings and they have residual sugar all over the place. Some of the finest examples of local Chenin has a bit of R/S on them, not to even speak of Vouvray! Surely the analysis of the wine is totally irrelevant if the wine has finesse and balance? Surely it is ok for a wine to be approachable? Hi Simon, I would agree that how the drinker perceives the wine in the glass is ultimately more important than anything we might deduce from technical analysis but as I eluded to in my original tasting note, I did find it perhaps a little too “round” (without advocating austerity for austerity’s sake). In most vintages the Roussanne is my favourite from this label – well done, Chris! Ja, RS can be quite an elixir for fatigued palates and one cannot totally discount the relationships Chris holds with some key people – without trying to discount any of his achievements. What exactly are you implying here, Jonathan? Johnno I’m his home taster, he holds no influence over me. On the day for 5 stars everything is done blind. That’s an idiotic comment. there is no perfect wine comp – for a multitude of reasons – what is your view of the above / below? So please indulge me – and I am sure the rest of your audience – what would you have voted the white wine of the year? The problem here is that I understand you excused yourself from Platters because of money. So now as an outsider you’re rather critical. That’s very Pendock of you. Perhaps if you added your voice on the day “a worthy contender” might’ve been selected? No? Hi Simon, This thread really has taken a bizarre turn! I have no beef with the Platter’s publisher, editor or tasting team (many of whom I would consider friends) but do hold them to account on matters of wine assessment just like I would expect them to do to me in return. I did indeed resign from Platter’s on the basis that I thought my energies would be better rewarded if I devoted them to Winemag.co.za but the parting was not acrimonious and I’d like to think SA wine is richer not poorer for having more rather than fewer specialist titles covering it. I have always admired all the wines under The Foundry label (as a quick search of the archives will demonstrate) and all I’m saying about the Grenache Blanc 2015 is that, while immensely appealing, is not the most profound wine I’ve ever encountered from this operation. As for other potential White Wine of the Year nominees, feel free to search our ratings database by score. Christian – that’s a horrific cop out. You nailed your colours to the mast with the statement “Suffice to say, however, that I can think of quite a few other worthy contenders for “White Wine of the Year” but now the flag that you hoisted only made it halfway up the post? Hi Simon, As previously, I’ll be posting my top 20 wines of the year in early December – be patient! Simon are you saying nobody dare have an opinion contrary to Platters? Care to reveal your day job? You did click ‘i’m not a robot’ right? Oh I’m just a lowly tour guide Jonathan. Nothing major. And you’re of course entitled to an opinion. But as these things go – and I am SURE you’ve heard this before – opinions are like assholes, everyone has one… So perhaps if you can back up your opinion with a bit more than just “oh this is what I have to say and bugger you” and perhaps have a coherent argument (I must say your comment below doesn’t inspire confidence in the coherent argument stakes I’m afraid) then perhaps, just perhaps a proper debate can be held. I certainly don’t think that Platters is the begin all and end all. In actual fact it has many many failures. The glaring omission of Newton Johnson for 5 stars this year is just one of many. Last year Eben Sadie didn’t get a single 5 star. Bizarre. However, I’ve been reading Winemag.co.za since the days of What I drank last night and I know from experience that Christian isn’t a particularly big fan of certain varieties – lighter reds like Pinot Noir and Cinsaut amongst them – and he tends to score them low. So that means he has preferences for certain styles and therefore he tends to miss certain things. And then penalising a wine for being “too approachable” is just – well… an incoherent argument. So no robots here, just a non wine person asking some questions of the “professionals”. How do you fit into the Winemag fan club? No comment on the Foundry’s white wine of the year at all (would love to buy a bottle to try)… but in theory, a wine can be too approachable. Only trying to establish if you’re an imposter Simon,, apologies if it appeared like I was questioning your credentials. I have no credentials. Just an interested amateur. So you can question all you want. But at the same time I can question the professionals – no? To add my own perspective to this matter, having some RS on a wine is sometimes a consequence of not playing it safe with regards to the winemaking and pushing the envelope to try to produce the most interesting wine. In the case of the 2015 Grenache Blanc, some barrels were not innoculated with yeasts and consequently retained a little RS. In assembling the blend, I tried to make the best possible wine, not the safest commercial proposition. In fact this is the raison d’ etre of The Foundry. I am really pleased and proud that Platter saw fit to reward this wine. I always say the truth of the wine is in the last glass, not the first taste. I have had no problems in polishing off several glasses of this wine and the RS doesn’t bother me as I feel all the other elements are in balance and tension providing a sustained hedonistic experience, which at the end of the day, is the proper job of any wine. I am grateful to all for the good wishes and equally grateful that this wine has stimulated such spirited debate. I think its pretty funny that this thread has turned into this and yet the actual Platter results post is eerily quiet…crickets! I think Chris’ wines rock and I was a fan of his Grenache Blanc before any of you (…so there). He was way ahead of his time- and the revolution- with Southern Rhone varieties. Its about time it was recognised. Why don’t you take all of this creative feisty energy and come up with some ideas of where South African wine criticism, wine writing, wine media, etc can go in the next 5 years. We need some new ideas, innovative vehicles for them and positive experienced voices. I agree Samantha – hence me begging the question how Christian got to 91 points – which in his scorebook is akin to 3 stars (he’s been scoring in a band from 89 to 92 for years) – when it appears that everyone else in the industry who’s tasted it professionally can see the greatness in the wine. As much as Christian would say 91 is a high score, to me (and everyone else with an inkling of how wine is scored) it is a fence-sitting, “I don’t actually have an opinion on the wine” score. it is irritating to the public. Put out or shut up. Take a position away from the fence. Hi Simon, Not sure how much more explicit I can be about The Foundry Grenache Blanc 2015 – the residual sugar adds a plumpness that stops it from being truly outstanding. To my mind. I’d be quite happy to see it at 4.5 Stars in Platter’s but not 5 Stars and certainly not White Wine of the Year. As for your contention that I score in a narrow band, you are not wrong. South African wine is now at a point where making sound, technically correct wine should be a given. Even so, I still taste quite a few average wines (sub-86 points) and my position on these generally is that it doesn’t help either producer or consumer to write about them. Conversely, I don’t think 95+ wines are that commonplace just yet no matter what Platter’s or anybody else might have you think. Chris, is 2018 your last vintage at Meerlust? …I still taste quite a few average wines (sub-86 points) and my position on these generally is that it doesn’t help either producer or consumer to write about them. I know this is an old thread but just going through it and thought I may add my two cents. I cant but help think that your above comment is misplaced. Surely by publishing the scores of wines that rate sub 86 you HELP the consumer and the producer. I as a consumer I want to know what wines are faulty, stylistically incoherent, perhaps unfashionable and old school. I might then taste the wine and consider my own opinion. The same with producers, they want to hear the voices of critics, they want to be guided, re assured. If they hear nothing but reassurances and praise then how are they ever to improve? I know that you are a fan of rock music, movies, books etc Imagine if we only read ratings of art, music and movies that were good or great? Why should the wine world be immune to criticism? Hi Dion, I agree that criticism should involve analysis of both merits and faults and I’m quite prepared to deliver a good trashing if needs be (the recent review of the Nederburg II Centuries Cabernet Sauvignon 2013 a case in point). However, I think where wine is different to other cultural endeavours is that it can be roughly divided into “commodity wine” (the producer never intending such for critical appraisal) and “fine wine” (worthy of contemplation). There’s a helluva lot of wine out there and most of the time, I’m trying to guide readers of this site to what they should be drinking and not what they shouldn’t.